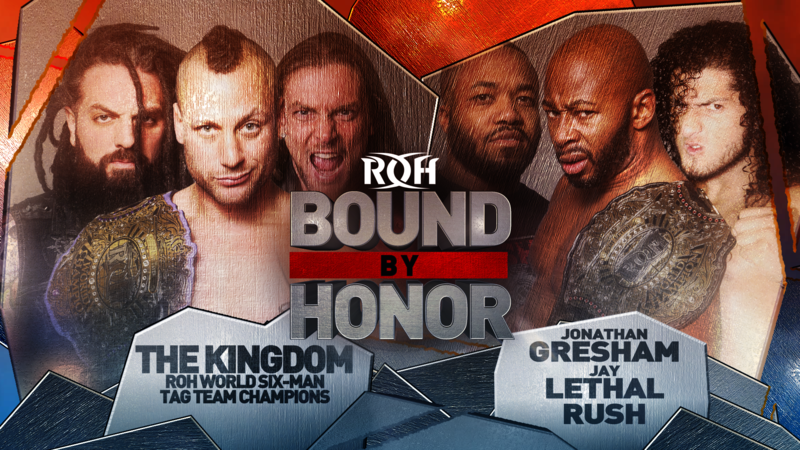 Headlining Bound by Honor in Miami is a huge six-man tag match pitting ROH World Champion Jay Lethal, RUSH and Jonathan Gresham against ROH World Six-Man Tag Team Champions The Kingdom (Matt Taven, TK O’Ryan and Vinny Marseglia). Taven has been walking around with a faux ROH World Title belt and calling himself “the real world champion” for months now, and it’s finally started to get on the nerves of Lethal, the legitimate world champion. Lethal has said that Taven is going to get what’s coming to him, and he will have the opportunity to make that happen in Miami. RUSH -- who recently signed with ROH and is one of the biggest stars in CMLL in Mexico -- and Gresham also have their issues with The Kingdom. In his ROH debut in December, RUSH defeated O’Ryan, but he was attacked by Taven, Marseglia and O’Ryan with chairs after the match and left lying. The bad blood between RUSH and Taven goes back CMLL’s 85th Anniversary Show in September, when RUSH and Taven were on opposite sides of a hair versus hair tag match that resulted in Taven having his head shaved. Gresham had been scheduled to face Taven at Road to G1 Supercard: Houston last week, but O’Ryan took Taven’s place in the match after Taven said Gresham wasn’t worthy of getting a shot at his “real world title.” O’Ryan went on to score a tainted victory over Gresham, as he put his feet on the ropes for illegal leverage when making the pin. Will Lethal, RUSH and Gresham make The Kingdom pay for their transgressions in Miami? Or will The Kingdom continue to be a thorn in their sides? Join us LIVE for the fast-paced, in-you-face action that only ROH can deliver to find out!